If you need me I'll be here. Now here's someone who does excel at fishing. 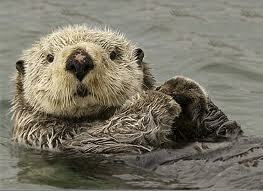 Adorable sea otter. I have not seen one here. Not sure if they hang out in the Adriatic. Have a nice time on the Adriatic sea :) my country has the best beaches and the cleanest sea and the weather is wonderfull now! Have fun!!! Ha ha. Like some cosmetics company is going to GIVE me anything. I rather think not! Just a few of the blogs I read. There are stacks more. Oh Wow, Did I just get Into Blogger? - Hello there! I am hoping this works just running some "Test" Spam time. Bare with me Abyss! Please Update links! - Just a reminder, if you still have this url saved I have moved to lacquerlaine.com! Can't wait to see ya'll there! Illamasqua Shattered Star Nail Varnishes - Here they are :) TRILLIANT MARQUISE FIRE ROSE You can also find these on the Illamasqua website. Plane Beauty - All things superficial! Models Prefer - Girls Night Out - Please wait whilst you are redirected. If you are not automatically redirected, please click here.